We highly recommend using Swift’s comprehensive Evaluation Kits to test Piksi Multi for your specific application. Our Evaluation Kits contain everything needed for a successful RTK assessment. 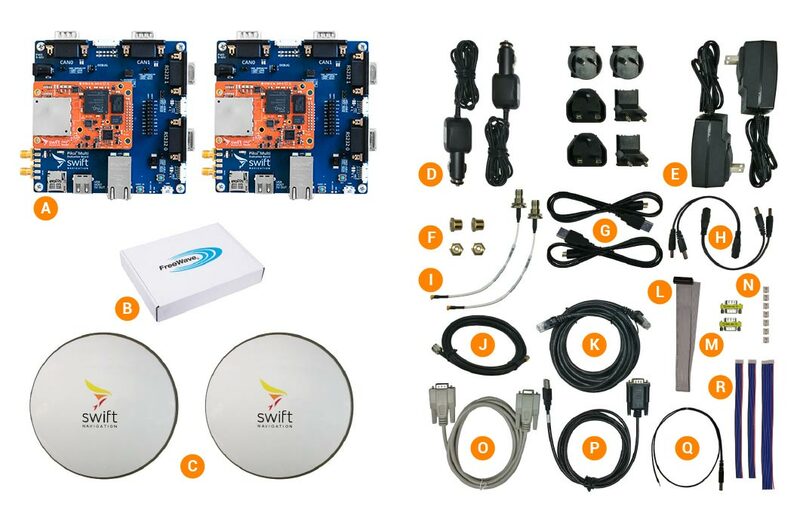 These professional kits allow you to quickly and easily set up a centimeter-accurate GNSS RTK system and contains what you need for rapid RTK prototyping and testing. In addition, the high-quality radios with effective ranges up to 15 kilometers (~10 miles), antennas and accessories allow you to check performance and functionality in a real environment to ensure a successful assessment. The items listed below are included in each Evaluation Kit. Radios are available in 915 MHz (US) and 2.4 GHz (Europe and other countries that do not allow 915 MHz for license-free operation). Note it is very important to select the correct version; compliance with local regulations is your responsibility.